Looking for one stop shopping for your kids? 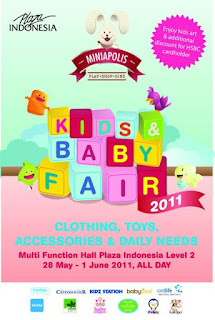 Then Kids & Baby Fair is your perfect destination. Visit the bazaar participated by high quality brands: Cotonnier, Kidz Station, Baby Empire, Baby Bee, Kakapo, Cordlife, One to Ten, Pure Baby, Pukuhouse, Protect a bed, Healthy Choice. Yes, we know those brands might be out of budget. That is why you should come to this event because there's bunch of discounts waiting for you! And not to mention the additional discounts on selected tenants for the HSBC Credit Card holders only. If you're taking your kids with you, then Doodles is the right place to challenge their creativity by making arts and crafts. So, what are you waiting for? Make sure to mark the calendar so you wont miss this event!